100ml hot vegetable stock, made from concentrate. The first thing to do is get the cous cous on. In a saucepan with a lid add 1tbsp of the olive oil. Gently cook the pepper and cous cous over a low heat, stir in ½ the lemon zest and half the parley, pour over the hot vegetable stock, turn the heat off and place a lid on the pan. Leave for 10 minutes, or until you need it. Meanwhile pop your oven on to 200*c.
Mix the harissa spice, remaining olive oil and lemon zest in a small bowl. Place the mushrooms and asparagus onto an oven tray. 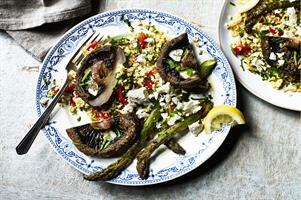 Brush the harissa all over the mushrooms and asparagus. Top the mushrooms with slithers of garlic, cook in the oven for about 10 minutes. When ready to serve, divide the mushrooms and asparagus between your plates, crumble over the feta cheese and the last of the parsley. Serve the cous cous on the side, crisp salad, pitta bread and lemon.